While natural and organic products have grown in popularity, it can be hard to keep them fresh in typical storage bottles. And since these products tend to cost more, wouldn't you want to preserve them as long as possible? Whether you need storage for your kitchen or your beauty space, Infinity Jars has a fantastic selection of glass jars. They have a great range of sizes and styles to suit practically any product. I have several products in my beauty collection that fit in these great glass cosmetic bottles. I have organic serums, face moisturizers, and toners that could all benefit from a prolonged shelf life. So what makes Infinity Jars different from typical jars and containers? Infinity jars are made from European glass that provides ultraviolet light filtering in order to keep products fresher, longer. Not only that, they provide an airtight seal so products won't spill or get exposed to air. I've chosen a few styles that suit some popular items you may have right on your vanity! 30 ml Glass Push Pump Bottle | This bottle is perfect for face serums, moisturizers or foundations. It even comes with a cap that slips over the dispenser so it's perfect for travel without worry about spilling. The 30 ml size is a very popular size for many face products and it's a great addition to my collection. 30 ml Glass Pipette Dropper Bottle | If you have any facial oils in your collection, a dropper bottle is a must. This 30 ml bottle is the ideal size for most oils and keeps them fresh so you can enjoy them longer. It provides easy dispensing and a secure closure so you don't have to worry about leaks. 100 ml Glass Fine Mist Spray Bottle | This spray bottle is probably my favorite of the three bottles. The mist is so fine and even, it far surpasses any facial mist bottle I've ever had. Not only that the tube goes straight to the bottom of the jar so there will be no wasted product! 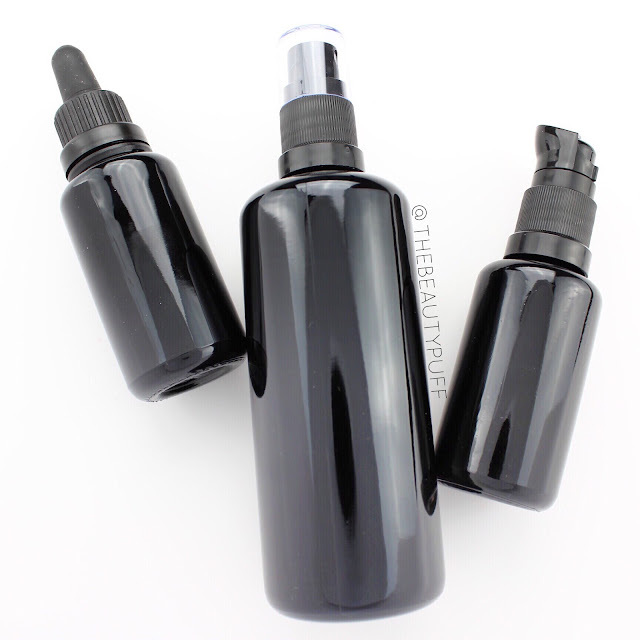 These bottles are fantastic quality and even come with labels so you can easily tell products apart. I love keeping things labeled and organized in my beauty room as well as my kitchen. Need jars for your spices? Infinity Jars has those too! Shop below for their entire selection.